Arthur Laffer advises in today’s Wall Street Journal that it’s time to “Get Ready for Inflation and Higher Interest Rates.” The market’s been telling us no less, as we’ve been discussing now for some time. Although the deflationary risk has been front and center since the financial crisis erupted last fall, the bigger challenge has always been the next phase, once the Federal Reserve succeeds in driving away the D risk. One need only review the market’s changing forecast of inflation in recent months to recognize that the future isn’t likely to look like the past. In charts we’ve been posting semi-regularly, such as here and here, the trend is clear: pricing power is returning. Yes, it’s coming off an extraordinarily low base, which exacerbates the relative comparisons. But there’s no question that the central bank has been using extraordinarily potent measures to resuscitate inflation from the grave. As we’ve been saying all along, we have every confidence that Ben Bernanke and company will be successful. The market is increasingly of a mind to agree, as indicated by rising interest rates this spring in government bonds. The benchmark 10-year Treasury, for instance, now yields 3.86%, as of last night—161 basis points above 2008’s close, according to data from the U.S. Treasury. Meanwhile, the futures market is predicting that by this time next year, Fed funds will be at ~1.2%, up from the current target rate of 0-0.25%, as our chart below shows. So far, the rise in rates and rate expectations is a good thing, as it suggests that economic equilibrium is returning and the appetite for risk is on the mend. 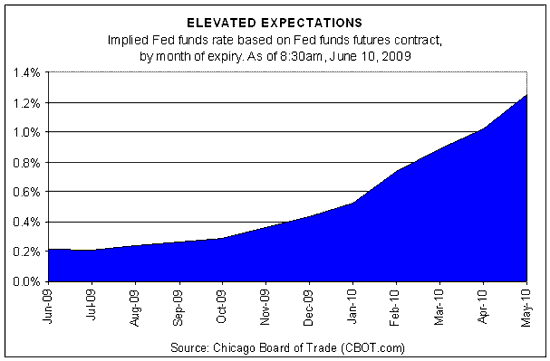 But at some point it’s time to start soaking up the massive liquidity that the Fed has created in the past year. Reasonable minds can debate on exactly when to begin and how far to go, but at some point, and perhaps fairly soon, the monetary equivalent of mopping up must commence. Laffer’s skeptical that reversing the liquidity injections will be reversed in a timely manner, if at all. “Alas, I doubt very much that the Fed will do what is necessary to guard against future inflation and higher interest rates,” he writes. Is The Core Inflation Concept Rotten?